Many of the world's most elegant hotels and resort spas, from the Sheraton in San Francisco to the Sonesta Beach Hotel in Curacao to the Renaissance Wailea in Maui, have pleased guests for years with ergonomically designed Oxygenics showerheads. 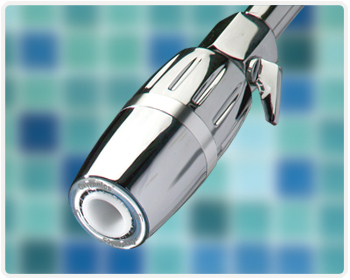 Oxygenics makes innovative, patented spa-quality showerheads that work in a revolutionary, remarkable way. They increase the velocity of the water flow, which makes it feel like you are using more water, but you really use much less than a standard shower head. The result is a phenomenal coverage and a continuous range of sensations - from a soft relaxing spray to a deep, therapeutic massage to everything in between. Everyone knows that oxygen is good for us; without oxygen, life as we know it would cease to exist. But did you know that oxygen is not just for breathing? Oxygen is a critical and sometimes overlooked component in water because the skin, being the largest organ in the body, absorbs the necessary oxygen it needs. 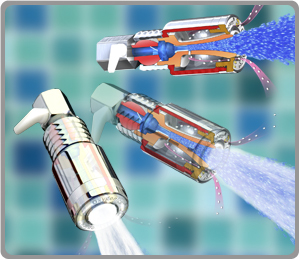 Oxygenics showerheads use patented technology to continually introduce air into the shower water creating a powerful oxygenated spray. In fact, Oxygenics showerheads can increase oxygen content in your water by up to 10 times! See How Oxygenics Showerheads Work. The beautiful finishes and craftsmanship are a testament to the greatness that lies within. Each showerhead is carefully put through a multi-step process to create a one-of-a-kind product that will maintain a like-new appearance for years to come. Oxygenics showerheads are available in multiple finishes, and provide the strength, toughness, and beauty that is necessary to ensure a long life and many pleasant showering experiences (see below for images of all Oxygenics showerheads). There is no other showerhead on the market that uses the patented Oxygenics technology, and no other showerhead is able to give you the same results. You are going to love your shower! Oxygenics uses less water overall, but since it plumps each drop with oxygen, you won't notice the difference. This allows for a dramatic drop in your water and energy bills because you are heating less water. 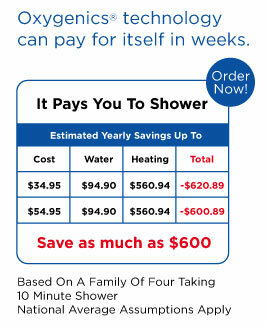 Oxygenics showerheads are designed to save 30% to 70% of water used by traditional shower fixtures, and the average family can save hundreds of dollars a year! Don't let mineral deposits and hard water get the best of you, like frequently happens with other showerheads. The single orifice design of Oxygenics showerheads, coupled with internal components made of non-stick Acetal Resin, increases durability and eliminates clogging, mineral buildup and corrosion. No cleaning required — install it and forget it! Oxygenics is virtually maintenance free! but it will also be the last showerhead you will ever need to buy. On an episode of The Early Show on CBS, guest and eco-interior designer Robin Wilson performed a green home makeover and recommended quality eco-friendly products that everyone can easily install in their homes to reap the benefits of green living. Among her list of suggested products was the Oxygenics showerhead. Water savings in the bathroom for the whole home can be quite dramatic. Sixty per cent of a family's water bill goes down the drain. The first thing to do is install an Oxygenics low-flow showerhead said Wilson. Fitness experts are raving about the oxygen rich benefits produced by this water oxygenator. From your first shower you'll feel the invigorating difference. The revolutionary Oxygenics Showerheads add 10 times more Oxygen to every shower you take. Imagine, your daily shower rejuvenating your body and inhibiting free radicals that can damage and age your skin. with an Oxygenics Oxygenator Showerhead! NOTE: We have a small selection of slightly used Oxygenics showerheads in stock, which were return by customers using our 30-day money back guarantee. Save 20% off these near-new units. To see the choices or order, click here.